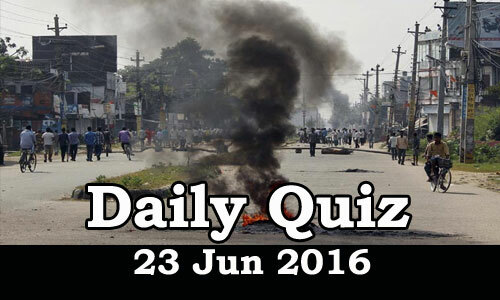 Daily Current Affairs Quiz 23rd Jun 2016, Current affairs and GK questions on National and International are listed in the Quiz. Candidates those who are preparing for Government Jobs and IBPS/SBI/RRB exams and all other exams can use these questions. 4. India and ________ have signed a Memorandum of Understanding to establish formal cooperation in the fields of skill development and vocational and professional education and training. 5. Which country will host a pledging conference next month to raise hundreds of millions of dollars to help Iraqis return to normal life? 7. Which is the most expensive city in the world for expats, according to an annual survey conducted by consultancy firm Mercer? 8. Which company has announced the appointment of AnupamPahuja as the Managing Director (M[D] and Country Manager for its India operations? 9. Name the Editor-in-Chief of Ananda Bazaar Patrika (ABP) and The Telegraph who resigned recently? 10. Olympian Anju Bobby George resigned as President of the Kerala Sports Council. She belongs to which sport? 11. Who received the 'International Icon Award' at the 17th edition of the IIFA awards ceremony, beginning in Madrid?